When it comes to towing, nothing beats a dually, but I’ll bet few of you have ever seen a tow rig like today’s Nice Price or Crack Pipe Chevy Blazer. Let’s see if its price also tows the line. Some people say that good things come in small packages, and you don’t get much smaller a package than last Friday’s 1974 TVR 2500M. Part of that goodness came from the car’s BMW M50 motor and slick Getrag stick, two of our favorite things. Sadly, all good things must end and that TVR’s price tag seemingly ended any ardor for the car, coming up short in a 65-percent Crack Pipe loss. Small wonder, huh? That was too bad for the TVR’s owner, seeing as he had seemingly put a lot of work into the car. Personalization of a ride can oftentimes negatively impact other people’s opinions of it because…well, you know, their jam may not the same thing as your jam. Also, not everybody likes jam. Let’s check out whatever kind of jam the owner of this 1982 Chevy Blazer Dually rocks as exemplified in this custom truck. 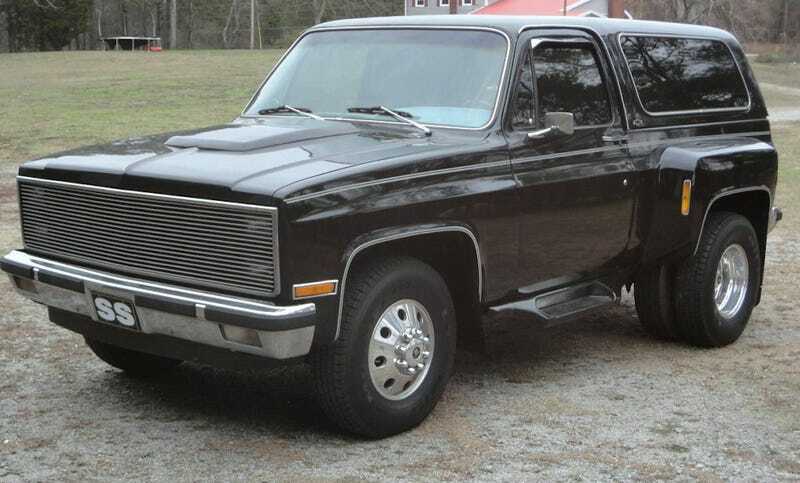 Now, show of hands here, who has ever seen a dually Blazer before? Not that many, right? These were apparently after-market built and married a one-ton dually rear axle with a standard Blazer frame. The wide fenders come from the pickup and integrate pretty well on the Blazer body albeit in a funky fashion on so short a truck. Those aren’t the only visually interesting elements of this truck, however. There’s also the Phantom grille, non-functional hood bulge, enormous Alcoa wheels (all six), and little running boards in case you like those. The seller says he’s retiring and hence cleaning house… er, garage, and everything has to go! And here I always thought retirement was when you were supposed to buy cool projects and just putter around the garage wearing stretch denim and JEGS T-shirts. I’m so disappointed now. This retiree is instead unburdening himself of earthly possessions and it looks like this custom dually is one that’s got to go, so let’s give it the once over. The black paint looks to be in fine shape with amazingly no scrapes on the fat fenders in back. Those massive wheels hold a pretty decent shine, as do both front and rear bumper. 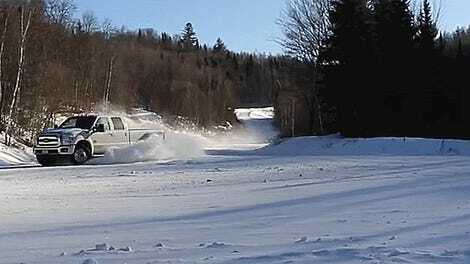 Despite the dually set up and one-ton suspension, the truck seems to be a bit more show than tow. The external mirrors are tiny, and inside they’re nonexistent as the rearview has been replaced with a DVD screen. That seems a questionable choice. Seats are okay and the truck comes with about the fanciest Grant GT steering wheel Pep Boys carries. A new dash cap will replace the existing unit before the pink is signed over, so ignore the carpet up there. The value of this being a one-tone dually is perhaps also belied under the hood where there seems to be nothing more than a 165-BHP/240 lb-ft of torque 305 small block in residence. That’s kind of weaksauce if you want to get work done, but at least the engine bay is clean and seemingly all intact. A 700R automatic is said to back that up, and the truck is a 4x2. I find this truck to be weirdly appealing, however I can’t quite put my finger on the reason why. It’s too wide to fit in most garages and parking spaces, and yet too short and lacking in oomph to make a capable tow or carry rig. Still, there’s something about it, sort of like watching Midget wrestling. There’s something about its price too. That’s $15,500 and it’s now time for you all to decide if that seems like a deal or not. What do you say, is this odd dually worth that kind of cash? Or, is this odd bodkin of a custom truck missing the mark in many ways including its price?